This is closeout item. Some designs are sold out. Ugly white bra straps peaking out from underneath clothing is a major fashion no no. However, with stretchy straps you can turn a major fashion faux pas into a fashion statement that makes you stand out from the crowd. Use stretchy to accent any oufit or to be discreet when wearing your leotard or other athletic wear. 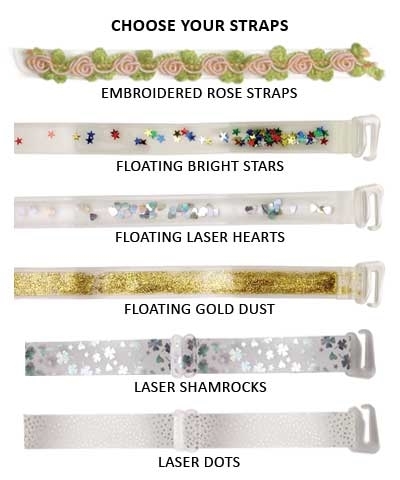 The floating straps are just a sliver of clear vinyl filled with a clear gel and with stars, hearts or metallic dust that moves up and down the strap as you push on the gel.